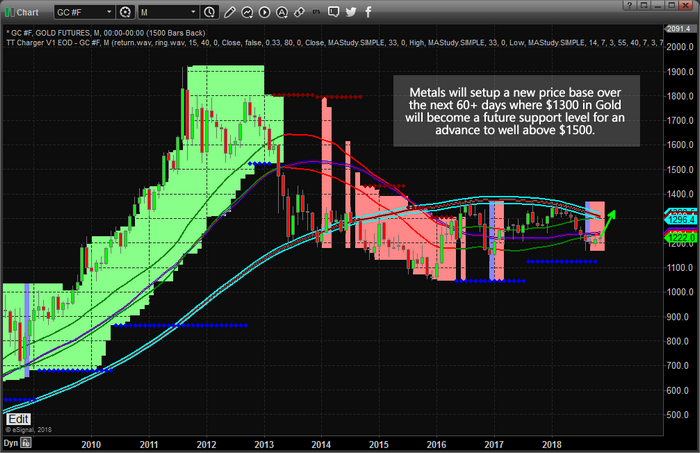 Metals Moving In Unison For A Massive Price Advance: Part II - Technical Traders Ltd. - Investment Strategies, Analysis & Intelligence for Seasoned Investors. We left off in Part I showing a number of supply and demand components and briefly highlighting our newest research using a custom Gold/Silver/US Dollar ratio index. Our attempt at finding anything new that could help us determine the future outcome of the metals markets and to either support or deny our future expectations that the metals markets are poised for a massive price advance was at stake. This new research would either help to confirm our analysis or completely blow it out of the water with new data. 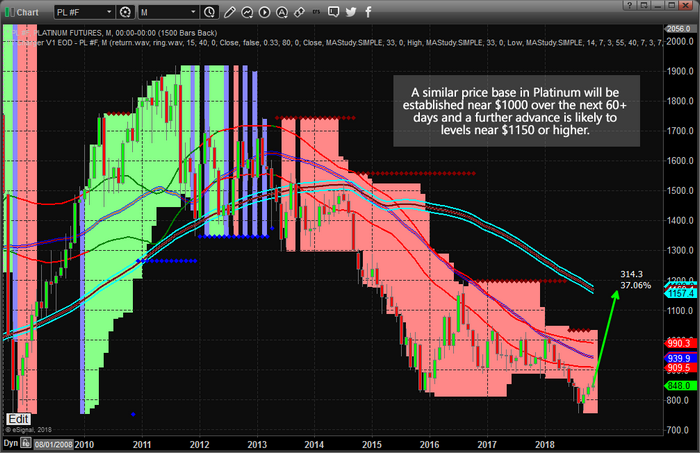 Let's continue where we left off and start by showing even more data related to our new custom metals ratio. This Monthly chart showing our custom gold pricing ratio and the correlative price of Gold illustrates a number of key features. If you remember from Part I, the current ratio level (the Blue Area chart) is near the top of the Upper Boundary level (0.80 or higher). Whenever the ratio level enters this Upper Boundary level, it typically only stays there briefly before falling towards the Lower Boundary level. We've highlighted what we believe to be key elements of this type of ratio/price reaction. On the chart, below, we've highlighted every major ratio level decline from near the Upper Boundary level and the associated reaction to the price of Gold as well as the indicator reaction near the bottom of the chart. With each instance, we can clearly see that price advanced, in some cases dramatically, as the ratio level declined from the Upper Boundary towards the Lower Boundary. 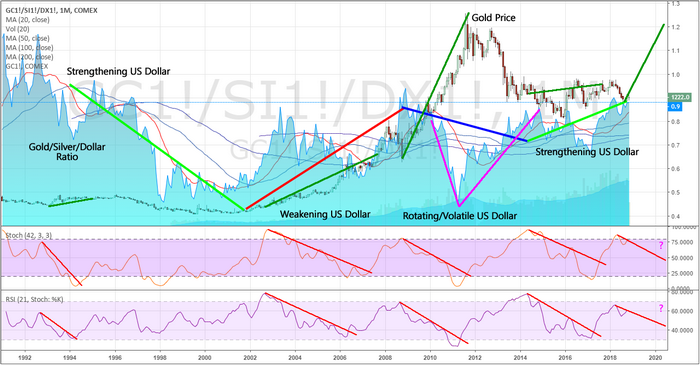 The biggest move occurred between 2002 and 2012 where two of these ratio rotations occurred. 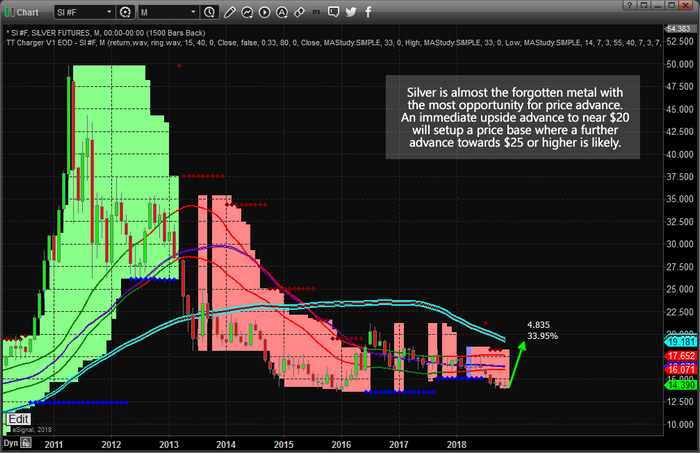 Again, this Monthly chart paints a very big picture – planning many years in advance of this move. We believe this new metals market rally is setting up to be something that Gold traders have been thinking about for decades – a potential of Gold reaching $5000 or higher in a dramatic price rally that correlates with broader global market events. We don't know what those events are at the moment, but we could certainly guess as to the nature of their origination.